FIRST Minister risks one step forward, two steps back if predecessor undermines her reassurances. NICOLA Sturgeon has been careful to be gracious in victory since the SNP’s general election landslide on Thursday. After the Scottish Nationalists won in 56 of the country’s 59 Westminster constituencies, the First Minister insisted that her party’s MPs would serve all voters, regardless of whether or not they backed independence. Furthermore, she reiterated her campaign position that the election was most assuredly not about the constitution. Instead, she said, SNP MPs had been elected to ensure that Scotland’s voice was heard louder than ever. Behind this conflation of Scotland and the SNP, her more detailed pledges were that nationalist MPs would campaign against what she characterises as government “austerity”, and work to ensure that the proposals for greater devolution to Holyrood – agreed by Lord Smith’s commission last year – are delivered in full. But yesterday, as Sturgeon presented her new MPs to the world, one among them went off-message. The SNP leader’s predecessor, Alex Salmond – next week to return to Westminster as MP for Gordon – said the party’s general election success was a “staging post” for Scotland, which would be independent in his lifetime. Sturgeon may have said that the 2015 campaign was not about independence. Salmond clearly believes it was. Sturgeon’s reassuring words are pitched at the majority of Scots who voted No in last year’s independence referendum. The SNP may have swept almost all other parties away on Thursday but the result reveals a country divided over the constitution. Salmond, bullish and confrontational, achieved much for his party but, in the end, he was too divisive a character to deliver a victory for the Yes campaign last year. Sturgeon and those close to her recognise Salmond’s imperfections and, while they are undoubtedly grateful for the progress he made in the name of their cause, they believe a new, gentler approach is required. And so, where Salmond would hector, ­Sturgeon prefers to soothe and persuade. Now may be a good time for the First Minister to assert her authority over her former boss, for the good both of her party and the country. Those who Salmond brought into the nationalist fold during his leadership may safely be considered still to be on-side. The general election result bears out the suggestion that those who voted Yes last year have decided to stick with the SNP. If the lationalists are to increase those numbers, then, Salmond should keep ­quiet. 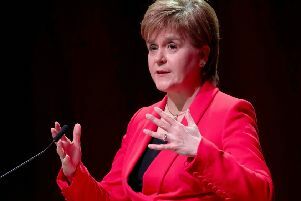 Sturgeon may be able to encourage some sceptics that the SNP is a different party under her leadership, but each Salmond outburst will undermine her. Every step Sturgeon might take forward, propelled by cautious reassurance, will be hobbled by Salmond at his most flamboyant. His rallying cries may be music to the ears of those already convinced but they are a turn off to others. The referendum result stands as proof of that. And while the SNP would benefit from a little less Salmond, so might Scotland. It is undoubtedly the case that the referendum created a division that will take a long time to heal. Political differences have spilled over from Parliament onto the streets. In the aftermath of the referendum, Salmond made little attempt to reunite Scotland. Sturgeon, on the other hand, is more alert to the need for Scots – regardless of their views on the constitution – to find some agreement on a new settlement. She should be supported in meeting this challenge. There remains, in Scotland, majority support for the United Kingdom. We must take Nicola Sturgeon at her word when she says she respects this. But, unless she instructs Alex Salmond to follow her lead in this matter, her credibility may be damaged. FROM the moment he was elected Labour leader in 2010, Ed Miliband struggled to appear a serious contender to become Prime Minister. His brother David had far more support among MPs and seemed on course to succeed Gordon Brown until powerful union barons threw their weight behind Ed and he emerged the surprise victor. That outdated selection process – now replaced with a simple one-member-one-vote system – meant Miliband led a parliamentary group which never fully united behind him. But apart from questions over the legitimacy of his leadership there were other factors that played against him. Unfortunately for Miliband, he was never able to shake the perception that he was an oddball, a geeky policy-wonk rather than a potential leader of the United Kingdom. However, Miliband’s image was not the only hobble on his ambition to become Prime Minister. He failed to convince that he had a grip on the very business of politics. Take his failure to deal effectively with the threat of the SNP to his party’s chances in the general election. While the Conservative Party used the prospect of the nationalists causing chaos as part of an alliance with Labour, Miliband failed to speak decisively on the matter. While Miliband hummed and hawed and sort-of-but-didn’t-really rule out any arrangement with the SNP, David Cameron and the Tory party fuelled an unpleasant English nationalism that helped them to victory. When Miliband fin­ally ruled out any SNP deal, he did so in such a ham-fisted way that it allowed the nationalists to tell Scots that Labour would be happier to see the Tories back in power than even to speak with the party of Scottish government. Labour will now select a new leader, a new potential Prime Minister. Candidates are Yvette Cooper, Andy Burnham, and Chuka Ummuna, all well-known parliamentarians, and all better communicators than Miliband. But they may yet be thwarted, as this weekend, some in the party try to persuade Dan Jarvis and Liz Kendall to agree a deal which would see one of them enter the contest. The briefing and counter-briefing has begun. Labour must be careful, amid the skulduggery, not to lose sight of the fact it needs someone who looks like a Prime Minister-in-waiting.